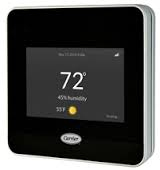 We carry a variety of Thermostats to keep your home comfortable. Total Comfort carries a variety of quality thermostat products from Carrier to provide precise control over temperature, humidity, air treatment and scheduling for your home or business in Port Orange. comes a thermostat that’s reinventing the way you manage your comfort and energy savings. Take control of your home with a fingertip or just let the Côr™ thermostat do all the work for you. Whether you’re on the couch, on the road or even on the other side of the world, you can stay connected to the heart of your home from the palm of your hand.